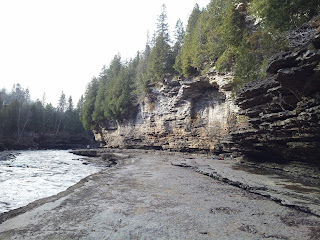 There are no developed cliffs in southern Ontario for drytooling in the off season. Climbing on established rock routes is really poor style and the mixed and drytool routes we climb in the winter require ice and or the rock to be frozen together. Because of the loose rock, climbing on the the unfrozen cliffs destroys the routes and can be a safety hazard. Rather than fly out west to take a break from training on man made structures we took a 3 day weekend trip to St.Alban, Quebec. The rock there is pretty bad but not so bad that it needs to be frozen together to climb on it, though some frost doesn't hurt! A 3AM wake up, 8 hours of driving and we were there by noon ready to climb. The weather was much warmer than we expected but still cool enough that we didn't feel like we should be rockclimbing instead. There aren't any really hard routes there but there are a lot of moderately difficult routes which make for good onsight practice. This is a place we had visited a few times a number of years ago and it would be good to see how my climbing had changed as well. At the far end is a cave with a handful of routes and the three hardest routes at the cliff are located there. First up was Extasie M10. Starting out I was a little nervous because I wanted to do this route first try. After getting past the first big move which wasn't as hard as ot looked from the ground I was too busy climbing to think about anything but where the next hold was and how to get to it. Before long I was at the lip of the roof and a little bit of lead to the anchor at the top of the cliff. One down. Next up was Petit Victor M10. This one had much less obvious holds and more widely spaced bolts. After climbing up under the big roof I stalled out for a few moments until I found a tiny hold and committed to making the first big move out the roof off of it. Much like the first route though it wasn't long and I was picking my way up the vertical rock at the top of the cliff, wishing the cliff was frozen so I could make use of the little tufts of dirt make great holds when frozen. Two down. Last was Histoire de coeur M10-. This is supposed to be the easiest, but the desire to do all three on one day was putting a heavy weight on me. The steep lower setion went by quickly, but I all nearly fell apart when a hold broke just as the next tool was hitting the next hold. Somehow I managed to hang on as I violently came out of the figure-4. Fighting my way across the rest of the steep rock and up the vertical rock to the top of the cliff was far more difficult for me than on the first two, but I did it! Day two we spent at the beginning section of cliff. There are a number of M9's that I had redpointed and or tried on earlier visits. It was a great feeling to go climb them again without much effort and a felling of control that I didn't have back then. Day three was another short one, climbing a few routes before making the drive back home. There are nearly 60 routes from M4-M10 at St.Alban. There is an online guide at Dr.Topo. The routes are all bolt protected. There are a lot of fixed draws which have been in place for a longtime and should be treated with suspicion. A 30M rope is long enough for the routes here. we cut a 60M in half to have two ropes or the weight of one. Bring some cord or double length slings for backing up or making an anchor as most routes have tree anchors. Extasie and Histoire need a sling for the anchor which is easily retrieved from the top when you are done. To climb at the cliff you must have an FQME membership. There are a few hotels around. We like Must Hotel www.musthotel.com located in St. Marc-des-Carrieres. There isn't always someone on site so you need to get a reservation booked ahead of time, but its the most affordable we have found in the area and less than 10 min from the cliff. There is a grocery store in St.Marc that sells beer and wine. There are several restaurants in town as well as two more outside of town at the Highway 40 exit. Pont Rouge is less than half hour away. This makes for fun alternative if conditions there are too dangerous. Knowing French or bringing someone along who does is a big help.